The eruption of Pavlof volcano along the Alaska Peninsula southwest of Anchorage continues to dribble molten rock down its slopes, trigger steaming lahars and spit small ash clouds into the air. The volcano awoke last week with a dramatic explosion that appears to have legs. The Alaska Volcano Observatory continues to rate the volcano's aviation hazard at the Orange level, meaning that the eruption isn't currently sending ash into flight zones but could at any time. Volcanic ash can damage or shutdown jet aircraft. Pavlof has erupted 10 (and possibly 13 times) in the past three decades, most recently in 1996. A surge in earthquakes beneath Pavlof on Aug 14 alerted scientists that it had awoken again. 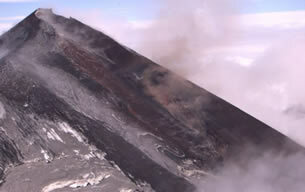 By Aug. 15, the volcano had begun erupting with lava, ash and steam. Cleveland Volcano - an Aleutian cone without its own seismic network - has also been sending ash into the sky. Korovin is stirring too.